There’s a new WordPress plugin out that can convert your WordPress self hosted blog into a slick, professionally designed iPad app. This comes complete with the iPad app icon for the homescreen, the “please wait while it’s loading…” screen, and then of course your blog itself. 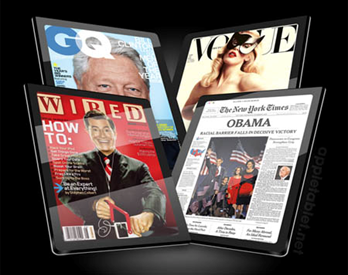 The app / plugin is called Onswipe, and carries the tag that reads Insanely Easy Tablet Publishing. The app is powered by HMTL-5 and it allows readers to flick, swipe, and tap away at your WordPress powered blog on the iPad. If you own one of the 18 million blogs on the WordPress platform, your blog is already to go on the iPad – just fire it up and take a look. Content layout changes according to the way that your reader is holding their iPad®. Get homescreen real estate! Now your readers can save your blog to their home-screen and have an icon right next to the rest of their apps. When readers tap on your icon, they will be presented with a loading screen with an image or graphic of your choosing. Padpressed grabs the image from your latest article and instantly makes a beautiful magazine-like cover for your publication. We pull your existing comments and allow your readers to leave their own.